HOUGHTON – Ten years after opening its doors, the Lake Superior Stewardship Initiative (LSSI) has reached about a third of Western Upper Peninsula students with hands-on stewardship learning. “What we try to do is prepare students to be citizens in their community and steward their community,” said Director Shawn Oppliger at LSSI’s 10-year celebration Thursday. With around 112 teachers working with the initiative to introduce students to stewardship, 2,274 students have been contributing to the community. The organization began in 2007 with nine hubs around Michigan, thanks to grants from the Great Lakes Fishery Trust (GLFT). Ten years later, the result of the LSSI’s efforts were on full display at the celebration with students and teachers from local schools showing off their projects beside local partners. 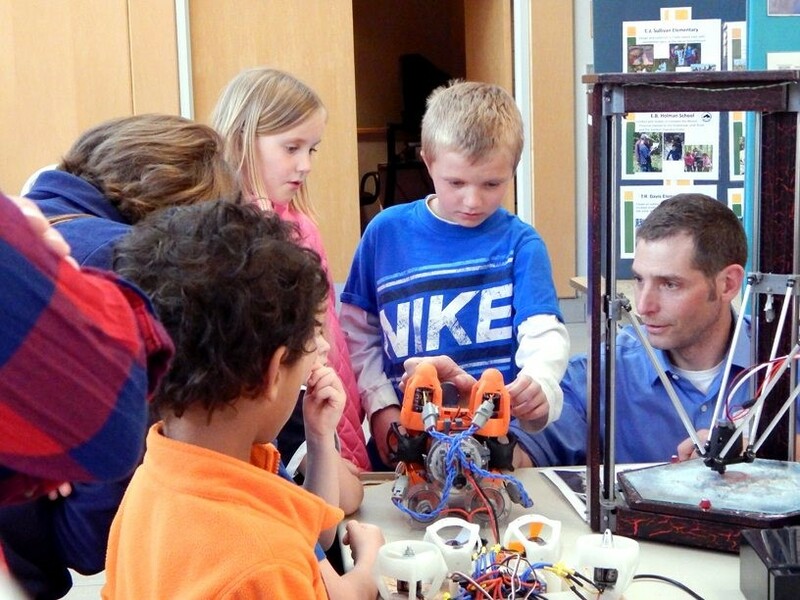 Dollar Bay math and science teacher Matt Zimmer (right) shows local kids a robot made by the Student Organization of Aquatic Robotics (SOAR). The 17 participating schools had many different projects with native plant gardens, environmental monitoring, beach cleanup, aquatic research robots and invasive species removal. CLK seventh-grade science teacher Darrell Hendrickson has seen these community-as-classroom style projects lead students to go on and pursue careers in the area. The LSSI will need more community support in the coming years, as grant funding through GLFT will no longer be available after this year. Joan Chadde, co-stewardship project adviser, thinks the LSSI and community are up for the challenge. The grant was funding $75,000 a year, with much of it going to teacher development and their projects within area schools, Chadde explained. The kids heard about taking only photos to keep an area beautiful for others, campfire care and camping on durable surfaces. To demonstrate different surfaces participants walked or stomped – across a range of materials representing types of ground cover. Snow (sugar) and a rocky pathway (lifesavers) were determined to be better materials. Come to the Lake Superior Stewardship Initiative 11-Year Celebration! © 2018 Lake Superior Stewardship Initiative. All rights reserved.